I know I don’t usually update the blog on Monday. Well, I haven’t lately, but that’s because of a certain psycho class schedule that I am not going to complain about even though my “busy semester” which I thought was going to taper off in December is now full-on until February. . . .
Now I just have to make it through December. Then January. Still, in light of the holiday, I didn’t update on Friday . . . so here I am. Baby girl would not eat a blasted thing. She is so picky. . . . I am *not* a Black Friday shopper, so while some of you were in line at 4am for door busters, I was tucked safely in my feather bed. And then I slept in. Honestly, it’s not worth the money I’d save for the headache I’d bring home. I took most of the day off on Friday to decorate for Christmas. We put up our “beautiful tree” (real: silver and shades of blue) downstairs, and the “family tree” (fake: full of personal ornaments) upstairs. They are the most beautiful trees in the whole wide world. Here’s your Fact on Monday: “Christmas Tree Smell” (Frasier Fir) is my favorite smell in the whole wide world. 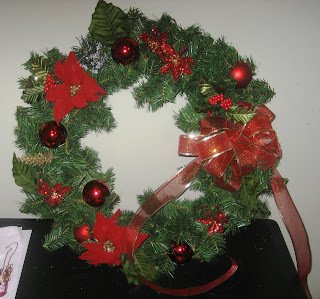 I also went all Martha Stewart (sans ankle bracelet) on everyone and made two wreaths. The sad thing, though, is that I had to work Saturday and Sunday to make up for the hours off on Thursday and Friday, but it all worked out. This week, I think, will be manageable. I might be able climb into bed BEFORE 2am. I MIGHT even be able to blog twice. In case you haven’t heard, New Moon opens today. If you haven’t heard, well, I’m wondering what rock you’re living under, because I’d like to share it with you. It goes without saying that I *will* be seeing this movie very soon. Hopefully soon*er*, or, as *soon as possible*. It’s so bad in my household that every time the movie trailer comes on, all work/play/conversation ceases. It’s so bad that my four year old, who has never seen the movie or read the books (for obvious reasons), has been drawing pictures of Edward and Bella ALL WEEK LONG. And yes, she knows them by name. She points out the pictures and movies and posters in stores, and she recognizes the books by their covers. Is it possible for a four year old to be a Twilighter? The truth is, though, that I can’t wait until she’s older and I can share the books with her (have sort of a mother/daughter book club thing) and watch the movies. . . .
And when she turns to me and says, “Mom, I’m so Team Edward,” I will sigh with happiness, because that means I’ve raised her right. I know the guy who I’m sorta married to but not allowed to talk about online is rolling his eyes as he reads this. I have but one thing to say to him: you promised to take me to the theater to see New Moon. Remember? As if you would ever forget. . . . In other news, the two of us are cooking Thanksgiving dinner together. We’ll see how that goes. 1. Still incredibly busy. As in . . . the last three nights in a row I’ve been putting in seriously late hours (in addition to daytime hours . . . my most productive time has been 11:30-2am). Yuck. The good news? This won’t last forever. The best news? Even though this was probably, by definition, the worst week I’ve ever had in terms of emails/papers to grade/discussions to answer . . . it turned out okay because I have a great guy who I’m sorta married to but not allowed to talk about online who handled dinner and dishes ALL WEEK LONG. (sigh) I *heart* him. 2. I’m a faithful follower of Project Runway. We’re down to the final three, and I don’t have a favorite. Where are the Christians and Santinos and Austin Scarletts this season? I think I’m leaning towards Irena, but I have such a love/hate relationship with her. Love the clothes/style . . . hate the snarkiness. 3. I finally upgraded my laptop with MS Office 2007. I have no clue what I was waiting for. I LOVE the new features in MS Word. This makes me a nerd, I know. I accept that. 4. I’ve become kind of a chocolate/candy snob. I totally discriminate. How do I know this? I had a Hershey’s chocolate bar on the counter all week and never touched it. I’m a Cadbury’s girl. And Halloween candy? We bought mini-packs of Skittles and Starbursts to give out and ended up with some left over. Now there’s a pile of yellow and orange Sarbursts in the cabinet, because apparently I don’t like them. I only eat the pink and red. And Skittles? Only the red and purple. At one time I was an equal opportunity candy consumer. No more. I wonder what this means. Life’s too short? I’m too picky? I’m so happy to have JonnySkov on the blog today! Jon is celebrating the release of his debut novel, STRUTS AND FRETS. I managed to snag an ARC at the SIBA meeting last month, and practically devoured this book. So, so, funny, but heartwarming and genuine at the same time (as heartwarming as teen guy musicians can be, obviously). This book deals with a range of emotions, and I definitely have a new appreciation for indie artists. More than anything, Sammy wants to play guitar in a famous indie rock band. The problem is that his front man is a jerk who can't sing, his bassist is a burn-out who can't remember the songs, and his drummer is just out to lunch. But Sammy needs this band because it's the only good thing he's got going. His father skipped out before he was born, his mother is an overworked therapist with a drinking problem, his grandfather is slowly losing his mind to Alzheimer's, and the girl of his dreams is dating his jerk lead singer. Now that jerk lead singer has entered them in a Battle of the Bands contest to win free studio time and guaranteed radio play. Sammy has two weeks to get them to sound like a real band, or face public humiliation in front of the entire local indie music scene. Jon Skovron is an insatiable music geek who can play eight instruments, but none of them well. He was born in Columbus, Ohio, has lived all over the US, and now resides with his wife and two sons in Washington, DC. His short stories and reviews have appeared in publications like Jim Baen's Universe and Internet Review of Science Fiction. Struts and Frets is his first novel. Jon: Definitely the goofy dialogue between Sammy and his friends when they're just hanging out. I was cracking myself up when I was writing it. Me: They had me cracking up, too. It’s always cool to get inside the head of teen guys. Scary, but cool. What kind of writing projects are you currently working on? Or, if you aren't working on anything new, is there a different demographic/genre you wouldn't mind tackling in the future? Jon: I am working on something completely different from Struts & Frets. Still Young Adult, hopefully still a nice balance of light and dark. But the next one is urban fantasy, which is actually my favorite genre. Jon: Wow, there are so many great people to choose from...definitely one of the big ones for me is Cory Doctorow, not just because he writes great books, but also because he is such a great model of how to make fiction relevant in the 21st Century. I turned into a big fanboy puddle when he told me that he liked Struts & Frets and planned to post a review on BoingBoing.net. Thank you so much for stopping by, Jonny! Hi Everyone! Today I’m thrilled to have Kristina Springer on the blog! Kristina is celebrating the release of her debut novel: The Espressologist. Kristina Springer has a Bachelor of Arts in English Education from Illinois State University and a Master of Arts in Writing from DePaul University. Her first novel, THE ESPRESSOLOGIST, was published by Farrar, Straus, and Giroux on October 27, 2009. Her second novel, MY FAKE BOYFRIEND IS BETTER THAN YOURS, also from FSG, will be published in the fall of 2010. She lives in a suburb of Chicago, IL with her husband Athens and their four small children Teegan, Maya, London, and Gavin. Kristina: Favorite part of the book: The ending. Parts I had the most fun writing: The Espressology nights. Kristina: I'm working on edits for my middle grade novel that comes out in the fall of 2010. It's called MY FAKE BOYFRIEND IS BETTER THAN YOURS. Me: (lol) Oh that is scary!! Is your MC based on ME?? And finally: who is your writing hero and why? Thank you so much for stopping by, Kristina!